Born in Baltimore, Maryland on July 2, 1908, Thurgood Marshall was the great-grandson of a slave. His father, William Marshall, instilled in him an appreciation for the U.S. Constitution and the rule of law. After completing high school in 1925, Thurgood followed his brother, William Aubrey Marshall, at the historically black Lincoln University in Oxford, Pennsylvania. His schoolmates at Lincoln included a distinguished group of future Black leaders such as the poet and author Langston Hughes, and the future President of Ghana, Kwame Nkrumah. Thurgood was accepted at the Howard University Law School, under the immediate influence of the dynamic new Dean, Charles Hamilton Houston. Paramount in Houston's outlook was the need to overturn the 1896 Supreme Court ruling, Plessy v. Ferguson which established the legal doctrine called, "separate but equal." Marshall's first major court case came in 1935 when he successfully sued the University of Maryland to admit a young African American Amherst University graduate named Donald Gaines Murray. Applauding Marshall's victory, author H.L. Mencken wrote that the decision of denial by the University of Maryland Law School was "brutal and absurd," and they should not object to the "presence among them of a self-respecting and ambitious young Afro-American well prepared for his studies by four years of hard work in a class A college." Thurgood Marshall followed his Howard University mentor, Charles Hamilton Houston to New York and later became Chief Counsel for the National Association for the Advancement of Colored people (NAACP). Mr. Marshall was asked by the United Nations and the United Kingdom to help draft the constitutions of the emerging African nation of Kenya. After amassing an impressive record of Supreme Court challenges to state-sponsored discrimination, including the landmark Brown v. Board decision 1954, President John F. Kennedy appointed Thurgood Marshall to the U.S. Court of Appeals for the Second Circuit. Marshall wrote over 100 decisions including support for the rights of immigrants, limiting government intrusion in cases involving illegal search and seizure, double jeopardy, and right to privacy issues. Biographers Michael Davis and Hunter Clark note that, "none of his (Marshall's) 98 majority decisions was ever reversed by the Supreme Court." In our own region of Southern California, Thurgood Marshall had impact on Mendez v. Westminster concerning the desegregation of Westminster School District in Orange County for Mexican American children. Without the Mendez case in the 9th circuit, Brown v. Board may never have been argued, or decided, until a decade or later. However, Marshall had no involvement with the case at the trial level. When the case was before the United States Court of Appeals for the 9th Circuit, the NAACP, the ACLU, and other organizations submitted friends of the court briefs. Marshall at that time was the lead attorney for the NAACP. He undoubtedly approved the NAACP brief and likely played a major role in its drafting. Mendez was also cited in the briefs filed in the five cases that produced the 1954 Brown v Board of Education decision. Instead, it laid the groundwork for the Brown appeals. In 1965 President Lyndon Johnson appointed Judge Marshall to the office of U.S. Solicitor General. 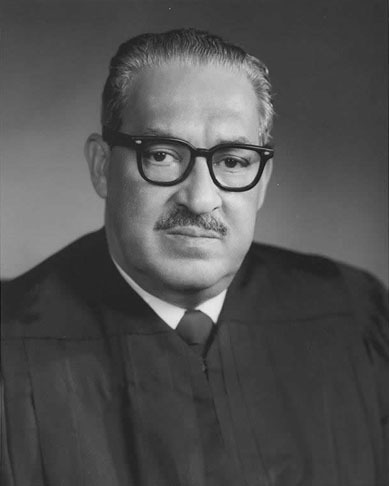 Before his subsequent nomination to the United States Supreme Court in 1967, Thurgood Marshall won 14 of the 19 cases on behalf of the government. Until his retirement, Justice Marshall established a record for supporting the voiceless American. He developed a profound sensitivity to injustice by way of the crucible of racial discrimination in this country. As an Associate Supreme Court Justice, Thurgood Marshall left a legacy that expands that early sensitivity to include all of America's voiceless. Justice Marshall died on January 24, 1993. The first official visit to our college by a member of the Marshall family was in May 2011 when Thurgood Marshall’s son, John Marshall gave a keynote address at the annual Scholar and Citizen Reception.